I'm always glad of an excuse to post an image of the moon! 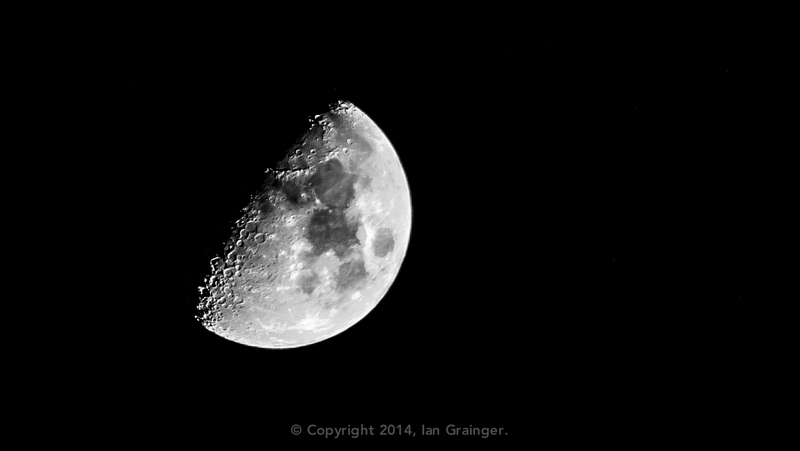 Like many, I find the moon a fascinating subject to shoot and thought I'd share some tips on how to shoot it. Surprisingly, you don't necessarily need a tripod to shoot the moon, and you definitely don't need to perform any long exposure photography. If you think about it, the moon is the brightest object in the sky, and reflects an enormous amount of light, so hand holding the camera is definitely a possibility. It goes without saying that you should attach the longest lens you possess to the camera - but I'll say it anyway. The best way I've found to photograph the moon is to set the camera to manual, with an aperture of between f/8 and f/13 (to capture the detail of the craters), and a shutter speed of 1/125th of a second. When happy with the camera set-up, I take a test shot. If the shot is underexposed (too dark), then I adjust the shutter speed and make it longer, say 1/60th of a second. Similarly, if the shot is overexposed (too bright), I adjust the shutter speed and make it shorter, say 1/250th of a second. I keep taking test shots, adjusting the shutter speed, longer or shorter, until I'm happy with the exposure. Of course, there will be a point where the shutter speed required is so low that camera shake will be visible on the final image. At this point you have two options. You can increase the ISO setting, or you can resort to using a tripod! This technique was used to take the shot above, hand held, using a 300mm lens with lens stabilisation turned on. The lens aperture was set to f/9 and the shutter speed was 1/250th of a second. I also had to increase the ISO to 500 to avoid camera shake. I hope you find these shooting tips useful. Happy Moon Watching!